June 24, 2018; Day 4) – In a story nobody could have written, Dongfeng has won the Volvo Ocean Race 2017-18 by winning a completely nutty final 963 nm leg from Gothenburg, SWE to The Hague, NED. The last day of the leg was setting up for grind-fest between MAPFRE, Team Brunel and Dongfeng Race Team, all virtually tied for the overall lead and to which the finishing order for these three boats on this final leg would determine their position on the overall race podium. But with TSS Exclusion Zones littering the course, it was Dongfeng skipper Charles Caudrelier and his crew who made a bold call last night to take a coastal route to the finish, which squeezed them tight against the shoreline and separated from the other leaders that had gone offshore. The decision hurt the team in the short term, falling back by as much 50 nm behind the others. 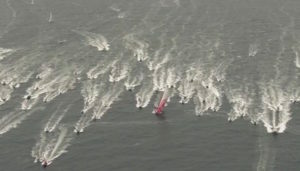 But by this morning, with less than 100 miles left to race, weather routing projections had the top boats finishing within minutes of each other. As the teams finally converged again this afternoon, just a few miles from the finish, Dongfeng was flying down the coast from the north with a better reaching angle to slide in front of the offshore group to earn their first leg win, propelling Caudrelier’s team to overall victory. Team Brunel skipper Bouwe Bekking would have liked nothing more than to win the race for the first time in eight tries with a home finish in The Netherlands. But it wasn’t to be. His fourth place leg finish left the team in third place overall. That In-Port Race, scheduled for June 30, will determine the sixth and seventh place positions in this edition of the Volvo Ocean Race. 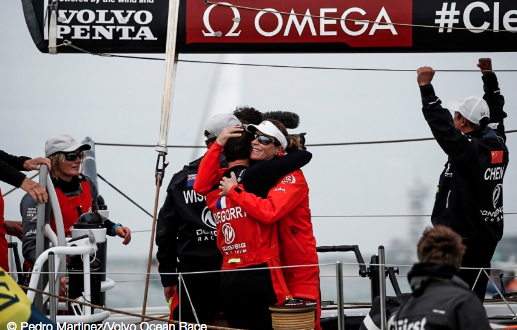 Both SHK/Scallywag and Turn the Tide on Plastic finished the Volvo Ocean Race on equal points. NOTE: The In-Port Race Series is a separate event, but should there be a tie on the overall race leaderboard at the end of the offshore legs, the In-Port Race Series standings will be used to break the tie. The race course for Leg 11 was revised prior to the start, adjusting the length to 963.4nm to ensure fan-friendly arrival times along the route and finish. After the start on June 21, the boats were sent west out of the islets dotting the entrance to Gothenburg before turning north to head to a turning mark just off the coast of Norway. Then, it’s a dive south to round a mark near the Danish city of Aarhus, followed by a return north around the top of Denmark before racing south to The Hague to the finish on June 24. For crew list… click here.